Live and going on now, join our first Kickstarter and get your hands on some awesome miniatures! Pick just one or select a group with one of the pledge levels below. 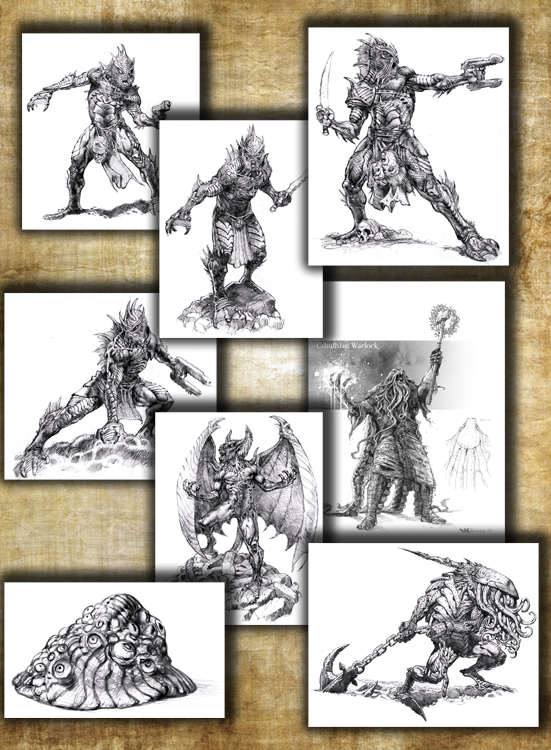 Pledge at this level and you get one of each model of Elite Deep One as shown in the picture. Elite Deep Ones stand between 8-10 feet tall so these miniatures are between 40-50mm in height. For those not interested in the fish folk comes this collection of beasts. At this pledge level you get the Cthulhian Warlock, Small Shoggoth and a choice between the Flenser or Murguba. The Warlock stands at 32mm tall so this should give an idea of the size of the other big beasties. Come on over and check out the awesome artwork by Danny Cruz and others as well as some tidbits of lore around each creature. And of course the unique, creepy and oddly beautiful sculpts by Roberto Chaudon. Come join us and see what's next! There are many more miniatures to unlock and the more backers we have the quicker we can show them off! Click here to check it all out: Slumbering Oblivion Kickstarter! !